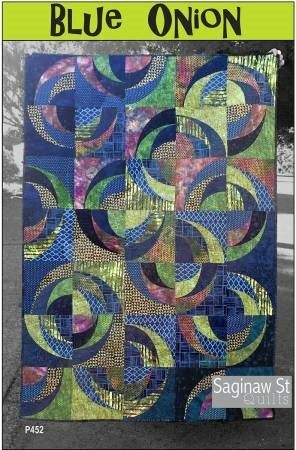 The Blue Onion swirling blocks are made from a variety of contrasting prints. To change it up - make them out of any 12 contrasting prints that you like. The arcs are long and gentle which makes them easy to sew. Work with 6 different prints at a time to make one set of blocks. Finished quilt measures 50 inches x 70 inches. Fabric Prep: Please iron all your fabrics with Mary Ellen’s Best Press before coming to class. Please be sure to bring your rotary cutter, mat and rulers to the first class as we will be cutting the fabrics.